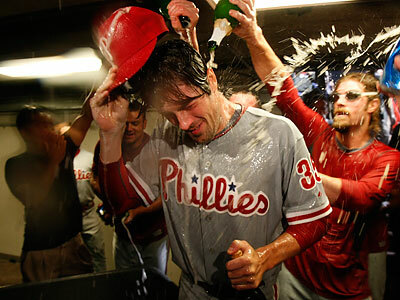 Cole Hamels pitched a masterful game Sunday as the Philadelphia Phillies swept the Cincinnati Reds in three games. Hamels threw a complete game, striking out 9, while only giving up five hits. The Reds were shutout, 2-0, the second in the series; the first, of course, was Roy Halladay’s no-hitter in Game 1. The Phillies now advance to the NLCS for the third straight year and will face the winner of the San Francisco Giants and Atlanta Braves series. This entry was posted in Cincinnati Reds, Philadelphia Phillies, Playoffs and tagged Baseball, Cincinnati Reds, Cole Hamels, NLDS, Philadelphia Phillies, Playoffs, Roy Halladay. Bookmark the permalink. I wish that we could have seen the Reds-Phillies series more competitive, but I think it’s a testament as well to how good the Phillies are. I’m not really sure that any of the Giants, Braves, Rays, Rangers and Yankees stand a chance in a 7 game series against the depth of this Phillies squad. It is going to be a very interesting post-season for Major League Baseball, and as a fan wouldn’t a Yankee-Phillie world series be the icing on the cake?